I've had in mind for some time that I'd like to terrace the small steep bit to the south of the garden, but it wasn't anywhere near top of the list of priorities. 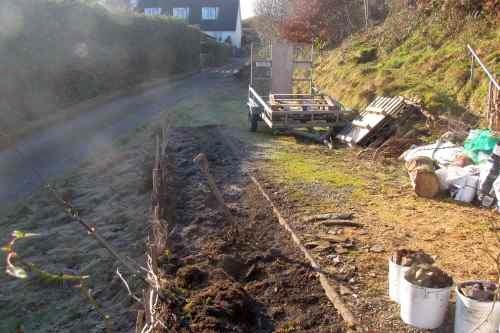 Then a friend offered me some topsoil, as he was digging a trench by the side of his house to deal with a damp problem. 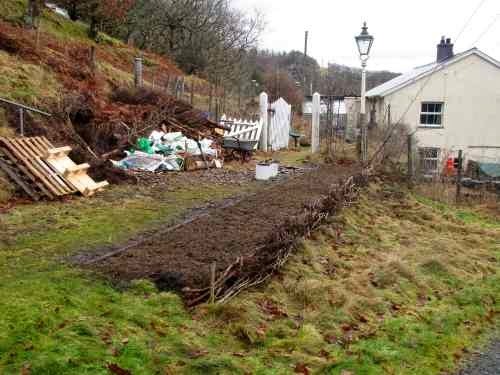 Free topsoil is not something to be sniffed at, round here, so I said yes please, and he brought several vanfuls of mud (in bags) over to our place and dumped it on a spare bit of driveway, next to the small steep bit. 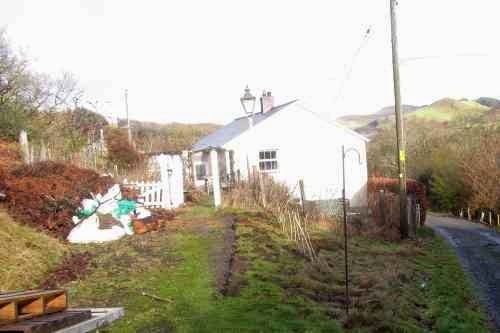 Those bags of mud have sat there since the summer and we're starting to think it would be nice to have that bit of driveway back, if only to dump something else there. So it was that in the middle of January, as the lengthening days made getting outside quite an attractive proposition, I started work on another terrace. I'd done some thinking about how to do this, and the first question was what to hold it up with. 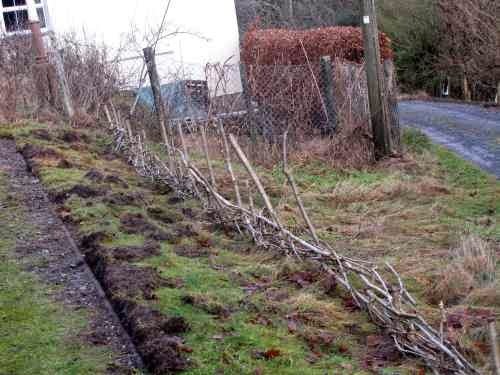 I thought a row of posts or stakes stuck in the ground might be a good start. So, where to get the stakes from? As it happens, we have a couple of coppiced oak trees on the hillside just above the new terrace. That is to say, at some point someone cut down a couple of oak trees and they didn't die. Now, an unknown number of years later (at least four. Probably six, guessing when it was likely to have been done), the young shoots are fairly substantial. 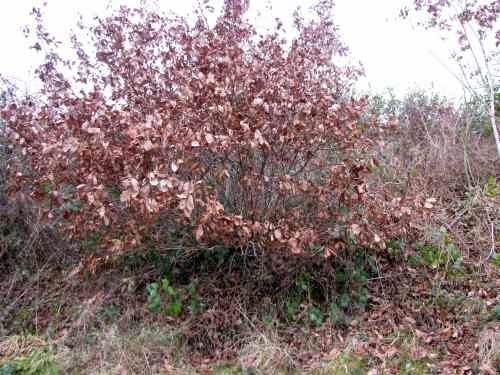 The first task, then, was to harvest some oak. It wasn't too difficult to cut, if a bit fiddly where the stems were crowded. Once cut, I then removed all the leaves and small twigs and took them up to the other terrace (yes, it still needs topping up each year). This took a while, but eventually I had a nice collection of straight-ish pieces, roughly sorted by size. Bits of oak obstructing the driveway. 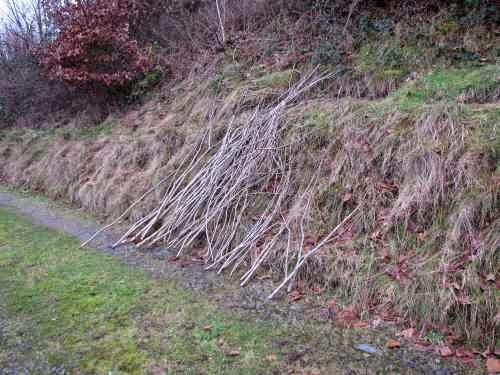 I then did a bit of pacing out, plucked a few numbers out of the air, and decided that I needed twelve four-foot stakes, to be slammed halfway into the ground so that two feet would be sticking out to hold up the terrace. I selected the twelve thickest pieces and cut them to length. After I'd done this I made some more measurements on the ground, to find out where the posts would need to go so that two feet came up to level with the driveway. Over six feet from the edge, as it turned out. That's too wide - I couldn't reach into the middle from each side. I brought it back to a bit less than four feet wide, so it won't be two feet deep, even at the steepest part of the slope. 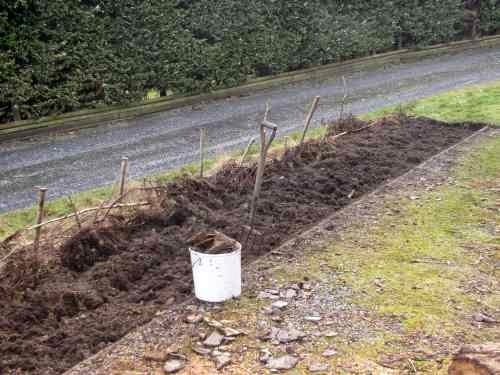 The next task was to get the stakes into the ground, pausing only to peel back some of the grass to reveal the kerb marking the edge of the driveway. The first few stakes went in quite easily, but then I hit stony ground - as most of it is round here - and the going got tougher. For the last few, where the slope is shallowest, I didn't make the holes so deep. They won't have to hold up so much mud, anyway. Yes, my hole-making steel bar has a hook on the top. What of it? I then cut eleven shorter pieces and stuck those a little bit into the ground, or at least into the grass, in between the structural ones. This enabled me to weave the thinner pieces between the verticals to make a rough fence. Having got the space defined, it was then a matter of filling it. I have quite a lot of dead leylandii, so I got rid of some of that in the bottom of the bed at the steep end, but there was a limit to how much of that I could get in and still expect to grow things on top of it. Next, I tackled the grass. I left half of it in place, and flipped the other half over on top of it. That makes it sound so easy. It wasn't. I picked out some of the bigger stones as I went. I quickly ran out of buckets to put them in. It's a fairly risky strategy leaving the grass in the new bed like this. If it was buried deeper, it would almost certainly all die, and rot down into a nice loam. As it is, the soil side of the turf isn't more than a few inches deep at most. I foresee weeding. We've had beautiful weather while I was doing this; for the record, Imbolc was bright and clear, as was the rest of the first week of February. This did mean that I had to wait until the sun was high enough to melt the frost before I could start work in the mornings. This kind of work is hard enough without everything being frozen solid. Finally, I got to using up the topsoil. I have to say, topsoil wasn't an accurate description of very much of it. You could make pots with this stuff. It was also full of stones, which I decided to remove by riddling. Some of the soil went through easily enough but some of the stickier clay just stuck to everything. 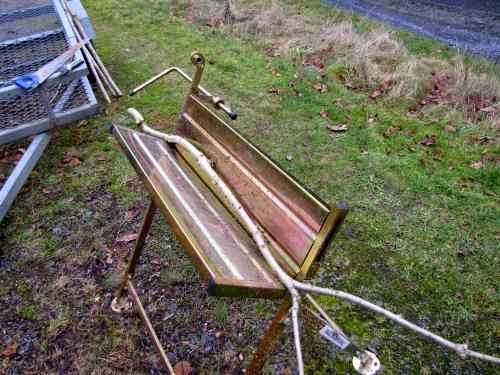 Some days I only managed a couple of barrowloads. I've been adding wood ash to the soil as I go. I'm not sure whether this will help to break up the clay or not, but it feels like it ought to. We got a delivery of firewood on Tuesday, which came with a bonus load of moss, so I added that too, then when I ran out of moss, I used some sawdust, which isn't ideal because it absorbs nitrogen as it rots. I'll worry about that later. As the end came in view, I was determined to get the job finished before the forecast rain on Friday. 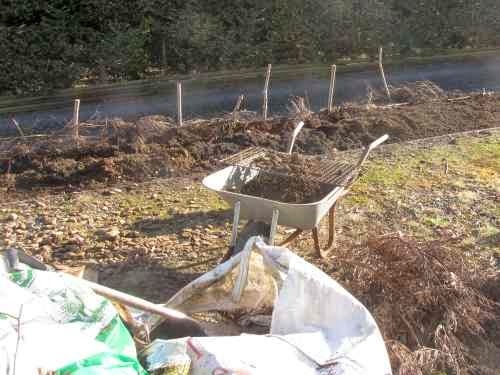 On Thursday I got eight barrowloads of soil riddled and dumped in the new bed. This meant working on after dark, but luckily we have an outside light just there. I was exhausted by the time I finished, though. The last thing I did, on Friday morning, was to trim the stakes down to just a little taller than the bed. Here is the finished bed. Now I have to decide what to grow in it. I'm currently thinking about sweetcorn and sunflowers, but that may change as I work out what's going where in the rest of the garden. In the meantime, I still have quite a lot of topsoil to find a home for. Unexpected reasons for learning Welsh: Finding oneself working as an extra in a TV drama, and all the directions are given in Welsh. I'll back up a little. The police drama Hinterland is filmed in this area, in both Welsh and English. This is terribly exciting and we had to watch the first series at least twice because the first time through we kept saying, Oh look, that's so and so! or, That's not the route to Aberystwyth, or, He'll never get mobile phone signal there, (really, we want to know what network he's with). This detracts somewhat from appreciating the story. We've also watched each episode in both Welsh (with subtitles) and English, as each scene is filmed in both languages. They're filming Series 2 at the moment and a call went out for locals to come along and play an angry mob of farmers and wives. Quite a few of those who turned up are actually farmers and their wives, one of whom had a few words to say about costume requirements. Do we really have to play to the stereotype? Why can't we just turn up in whatever we'd usually wear? Well, quite. It was fascinating to see how much goes into making a few seconds of film. The scene involved the detectives driving away from a remote rural location (most of the locations in this series are remote and rural), past an angry mob (who are unimpressed with the progress of the investigation). When we arrived at the base - not the location itself, but a nearby pub with a large car park - the first thing that happened was breakfast. This was a good start. We then had our costumes checked by wardrobe for suitability, and any brand names and labels were hidden. We then piled into various vehicles and headed over to the location; a farm gate with a line of police tape across it. Most of the day was spent standing around this gate, interspersed with moving back to allow the car through, and glowering at it. This had to be done many times to be shot from many different angles. We had to make sure we stood and moved in exactly the same place each time, and didn't adjust our clothes, which was checked frequently by wardrobe. Ian's long hair caused them problems as the wind kept blowing it over his shoulders. My lack of Welsh knowledge didn't cause too many problems. The longest instructions turned out to be a health and safety briefing that boiled down to, Don't get your toes run over. I only slipped up once, when I nearly pinched the star's place in the car, going from base to location. Luckily I was spotted and stopped before it got too embarrassing. It's incredible how much work goes into each scene, and this one didn't even include any dialogue. 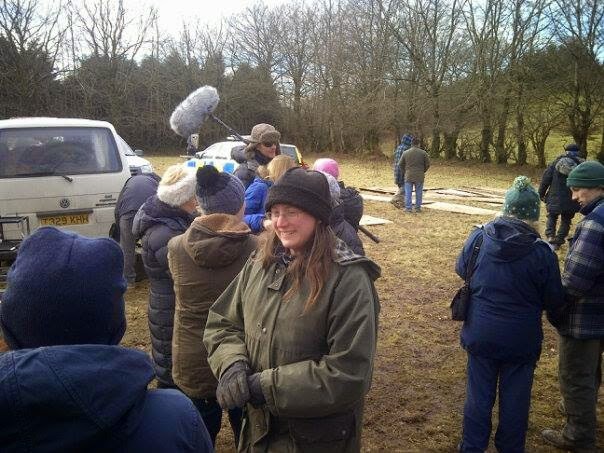 We spent half a day standing around in the cold, and depending on which angles are chosen, may not even end up on screen, but it was good fun get a look behind the scenes. If you haven't seen Hinterland, and if you like your detectives dark and brooding, do watch it. It's very good. The solstice has been and gone and, as the year turns, we have now come to Imbolc, which coincides with Candlemas, St Brigid's day, and Groundhog Day. I'm not sure how much these various festivals have in common, but the first of the three spring festivals (the other two being the spring equinox - Easter - and Beltane, or May Day) seems to me like a good time to mark the new year, so this is when you get my new year ramblings. As I have mentioned previously, I had depression towards the end of last year. I'm glad to say that with the lengthening days in January it started to lift, but it took me out for a good three months. From the equinox to the solstice, there were many days when getting up and dressed, feeding myself and my husband were as much as I could do. That said, I was able to do that much every day, so it could have been a lot worse. A year ago I hit on the theory that autumn depression is in fact a shift in motivation towards food gathering and storage. I'm not sure that entirely holds - there were harvesting tasks, notably cleaning sugar beet, that I couldn't face, but on the other hand, I found some enthusiasm for foraging, at least in fits and starts. I adopted an attitude of acceptance: It doesn't matter if I don't achieve anything, this is depression, I get it every year, there are reasons why it's particularly bad this year, it will pass. And so it has. From my perspective of now, this has coloured my view of the past year, so I have to make an effort to look back past the autumn equinox, and appreciate the rest of the year for what it was. Reading back to earlier blog posts, I see that the year didn't start too well either, with last year's depression not quite lifting in the spring, possibly due to poor diet. On the other hand, we did have a glorious summer, and I can't help being cheered by that much sunshine. I can't avoid the fact that this past year has been dominated by a lack of money. Ian earns his living by writing about classic cars (and yes, we are fully aware of the ironic juxtaposition between our green lifestyle and this source of income, but cars are his passion). He gave up a staff position on a magazine to work freelance so we could move to Wales. When times are hard, freelance commissions will go before staff jobs, and times have been hard. Visits to friends and family were cut back, foods such as avocados and honey were reclassified as expensive luxuries, for occasional treats only, and our underwear is in tatters. There was the prospect of something that had us hoping for most of the year, but it came to nothing in the end. In the meantime, the obvious question was asked, mostly by well-meaning family and friends, Why don't I get a job? I didn't, though. I even cut back on what little paid work I had been doing. In hindsight, perhaps not so sensible, but on the other hand, it did have the desired effect. I'd been struggling to focus on a challenging project, so I cut back on other things and succeeded in paying attention to the solar panels. And that's the point. I have struggled with this. Although in theory I could get a job for a short period of time, just until things are looking better, I fear it would take me away from what I want to do with my life and I'm not sure I'd be able to turn back. We have friends here who tried self sufficiency and have more or less given up. I can see that happening to me. Learning self sufficiency skills is not easy, but it's more than that. It's not just that I need space to give my attention to difficult projects, there's also a shift in mindset. The longer I'm out of the mainstream world of paid work and consumerism, the more alien it is to me. Of course I haven't left it completely - we're not hermits - but I mostly don't engage with a world in which trade is central. I don't sell my time and skills, and as far as possible, I produce rather than purchase. Given the all pervading presence of commerce, it takes a certain amount of isolation to maintain an anti-commercial mindset. Alternatively, if I manage to sustain my current frame of mind whilst re-engaging with the world, the constant contradictions would be quite distressing. This all sounds rather melodramatic, and of course it's not as all-or-nothing as I've made out, but I'm struggling to express why I'm reluctant to return to the world of paid work. I fear losing what I've gained in the last four years; I fear turning away from the road I'm on in case I can't find it again. That said, we do need some money. A few months ago I was moaning to a friend about our lack of funds and she said, But isn't this what you want? To live without money? Well... yes and no. Yes, I would love to be completely self sufficient*, but that's not realistic right now. I'm working on developing my skills - this last year I've learnt plumbing, for example, which is a case in point to illustrate why some money is necessary. I may not have to pay someone to do the work, but I still need to pay for the materials. In the more everyday area of food, I bake my own bread, but I don't grind the flour (though that might be something I could do in the future) and I don't grow my own wheat. The latter is something I'm unlikely to try, as the climate here is not well suited to it. There are limits to our self sufficiency. I will continue to push those limits back, but I can't realistically see the prospect of us living without money entirely. There is obviously a conflict between my desire to avoid the commercial world and our need for money, albeit not a huge amount of it. I find this easier to live with if Ian's the one earning the money, which brings us back to the fact that he hasn't been earning as much as we need recently. Now, finally, there is the prospect of something a bit more stable. I can't quite believe it yet, but it's progressed far enough that I can tell you about it. As well as his freelance work, Ian volunteers for a local community transport group, providing bus services for routes that aren't commercially viable. In rural areas this can be a lifeline. There are a couple of paid roles in this organisation, and the holder of one these roles has just resigned. Ian will be filling in temporarily, and will apply when the job is advertised. Hopefully, we'll have a regular income before too long. He will also be able to continue writing about cars in his spare time. Looking forward to the new year with a little less anxiety now, I'm starting to think about the garden, and various projects that I'll write about in other posts. I don't generally make resolutions, as I think that's setting yourself up for failure, but this year I felt the need for one or two. Firstly, I need to cut down on my computer use. I find it all too easy to get stuck on the computer, particularly when depressed, and this has become a habit. I've decided on the modest rule of not switching the computer on at breakfast time. Instead of Just browsing facebook while I have breakfast, which so often ends up consuming the whole morning, I must get up and do something, even if only the washing up, before switching the machine on. I did actually implement that rule in early January, and it's going well so far; I'm a lot more active than I was before Christmas, and the kitchen's generally tidier, too. This might be more to do with the lengthening days than rules about computer use, but I think it's a good rule anyway. I think I need a little more routine in my life (I'll come back to that another time), and this is a first step. The other resolution I considered is not your typical new year's resolution: I'm resolving to take less responsibility. Let me explain where I'm coming from with this. Over the past year I have been observing myself, in the same way that I did before making the decision to quit my job and try self sufficiency. I've known for some time that I have a bad case of volunteeritis. I've always thought of myself as a strong, capable woman. All the women in my family are strong, and this is a source of pride for me. When faced with adversity, I do not crumble, oh no, I step up to the mark and deal with it. I can handle anything! The trouble is, I can't. Whenever something needs doing, my natural tendency is to think, I could do that, and mostly it's true, I could. When I moved schools at the age of 16, my new teachers expected far higher standards than I was used to. I discovered then that if more is expected of a person, then more is delivered. It was an important lesson: If I challenge myself to do more than I think I can, then I probably will be able to do it. This is often conveyed as Step out of your comfort zone. I took that lesson on board wholeheartedly, never shying away from the difficult. In fact, I stepped out of my comfort zone so often that I really don't know what my comfort zone looks like. It's not a place I'm familiar with. I think maybe it's time to explore it, not with a view to retreating there for ever, but just to get acquainted. The trouble with constantly accepting tasks that are beyond what you think you can do is that sometimes they actually are beyond you. I volunteered as treasurer for a national club we're members of, with no knowledge of accounting. I'm pretty good with numbers - how hard can it be? Very hard, as it turns out, especially when taking over from someone with considerable expertise in moving numbers around to make them look right. Especially when you discover that a long-standing, popular member of the club has stolen a substantial sum of money. That was stressful. I volunteered as a committee member for a local community group. The principle attribute required for this seemed to be local knowledge, in which I felt myself singularly lacking. I spent much of the time in committee meetings with no idea what was going on, feeling very much out of my depth. I also volunteered to take over the running of live music events at our local hotel. This last was frankly ludicrous, as I know very little about music and lack the vocabulary to talk about it. I also take a dim view of the whole business of marketing. If there's a fun event happening, I am not the person to cajole everyone into joining in. My attitude is to let people know it's happening, then it's up to them if they want to come along. If they'd rather have a nice, quiet evening at home, that's entirely up to them. As a music promoter, I am the least suitable person in the world. I have now extricated myself from these things, with varying degrees of grace, and currently have few responsibilities. I was chatting to someone in the pub the other day who asked about my resolutions, so I told him. A little later I mentioned an upcoming event... You've got an event? As in, you're organising it? What about no responsibility? he said. Well, um, that's different. On reflection, it is different because the event in question is quite easy, relative to many of the things I take on. I suppose you could say that it's well within my comfort zone. Also, it's Ian's gig, really. I'll be honest - I know this is a resolution I'm not going to keep, but I will try to think carefully before taking on new challenges about whether I really am capable of doing them, and what impact they might have on the rest of my life. Last year was tough, but I'm feeling positive going into the new year. Things are looking up and I'm confident it's going to be a better year. 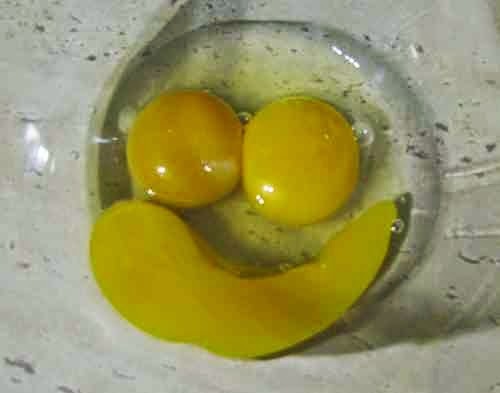 Look - even the eggs are smiling! * That is, I'd love to be part of a self sufficient community. It may be possible to live entirely by one's own efforts, but the general consensus amongst those who've tried it is that a small community is a better option.